Vegedog™ supplement is like magic - just add it to ordinary people food, using our recipes as your guide, and suddenly the vitamin and mineral content of the food is adjusted for dogs. It’s just that easy. Adjust the recipes if your dog needs to gain or lose weight - you have complete control! Although members of the order Carnivora, dogs are nutritionally omnivorous without the metabolic limitations of cats and other "true" carnivores. However, achieving the proper nutrient balance isn't easy, since their dietary requirements are quite different from people, as a result of their role in nature as scavengers, primarily eating flesh. 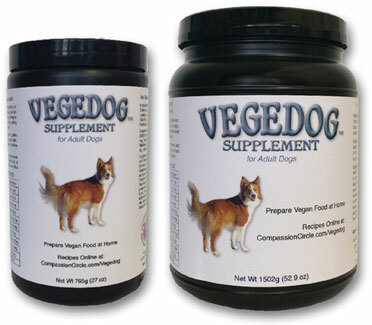 Vegedog™ supplement eliminates the guesswork. Used with its accompanying recipes, you meet the latest dietary recommendations by AAFCO (the same requirements all reputable pet food manufacturers meet) without the use of animal products. By changing the amount of Vegedog™ in the recipes according to the instructions, all stages of a dog's life are supported (growth, lactation and maintenance). Taurine is not considered a dietary requirement for dogs, but research indicates that some dogs may benefit by dietary taurine, so Vegedog™ includes taurine. Recipes meet nutrient levels established by the Association of American Feed Control Official’s (AAFCO) Dog Food Nutrient Profile for all stages of a dog’s life, without using any animal products. For detailed feeding information, download the Vegedog™ instructions in PDF format here. All Vegedog™ recipes contain food yeast (VegeYeast or other food yeast). No animal ingredients are needed or desired, so your dog can eat a cruelty-free diet just like you! From Lisa St Johns of Mesa, Arizona on 1/19/2017 . From David Broiles of Baltimore, Maryland on 9/29/2009 . My dog has been on this for 2-3 years and he is looking great is very active at 8yrs old. People still call him a puppy. His coat is great too. From Anonymous of Tokyo, Japan on 1/11/2009 . As far as vegan dog foods go, I have tried this and Ami. My dog loves both (she's never been one to be picky about food) but I think she's even more excited about this food because it's fresh and is a nice change from dry kibble. She goes crazy (in a good way!) on the mornings when I walk towards the fridge where I keep her food made with Vegedog, rather than towards her dry food location. Also, she is now quite old (almost 14!) and used to be a huge couch potato, but she's been running around the house now with much more energy and comes upstairs often (which she stopped doing before) and has regained her ability to jump!! I'm very grateful for this product (and Ami as well) as my dog's health has very, very clearly improved since switching to these products. Additionally, I don't find the prep work involved with Vegedog to be a hassle at all!